Seasons greetings to you this holiday season! As is our tradition during December, we want to publicly thank our Creator God for His love and faithfulness! The Holiday Season is a very special time for the Jewish and Christian faiths because they share spiritual beliefs rooted in the Torah (the first five books of the Bible) and they both celebrate the experience of faithfulness of the God of Abraham, Isaac, and Jacob. Following is a brief summary of why each celebrates. In Hebrew, the word “Hanukkah” means “dedication.” In 168 B.C.E. the Greeks seized the Jews’ holy temple and dedicated it to the worship of Zeus. Some Jews were afraid of the Greek soldiers and obeyed them, but most decided to take back the temple and rededicate it to the worship of God. After three years of fighting, the Jews defeated the Greek army, despite having fewer men and weapons. After rebuilding the Temple they decided to have a large dedication ceremony. They wanted to light the menorah but could only find enough oil to light the menorah for one day. Miraculously, the oil lasted for eight days – just enough time for them to locate new oil to keep the menorah lit. Today Jews celebrate Hanukkah for eight days by lighting candles in a menorah replica every night, thus commemorating God’s miracle and faithfulness. In Isaiah, the Bible speaks of a coming Messiah “And he will be called Wonderful Counselor, Mighty God…Prince of Peace.” The New Testament of The Bible says Jesus Christ is that Messiah, a descendant of Abraham through the line of David and the “only begotten Son of God.” The Bible says that God sent his Son to earth because “God so loved the world that he gave his only begotten Son, that whoever believes in him shall not perish but have eternal life.” Incredibly, those who believe that Jesus Christ is the Son of God and want to belong to his family are adopted into his family. At Christmas followers of Jesus Christ celebrate God’s faithfulness to his promise to send his Son to live with us. His followers believe Christ came to live a new way and to show us how to live with one another and with God his Abba, his Daddy—not only to live in peace but to grant those who follow Jesus the right to become God’s heirs! And that is what his followers are, heirs. We at ABA would like to take this opportunity to extend a sincere thank you to our clients, partners and friends for your continued business, referrals and support. May God bless America and may God bless you this Holiday Season and in the year ahead! via Blogger Season’s greetings to you this holiday season! Author’s note: We have intentionally reprinted last week’s Insider in a slightly different form to model the principle of repetition. The current political climate makes it difficult to have civil conversations about anything remotely political. Nevertheless, it’s important to find an effect way to communicate to our employees and other stakeholders what we believe is important. But how do we break the “sound barrier”? Say too little about any issue and we appear to be fearful or complicit with whoever is voicing their opinion the loudest. Say too much and we come across as bombastic and bigoted. In other words, how we choose to “show up” and the small daily deposits we make implicitly and explicitly shape what we communicate. It’s the small deposits we make that build credibility and reliability, a sense that our employees know what to expect. What can rapidly diminish the value of any trust built is that denominator of “perceived self-interest.” The stronger the sum total of the messages we send to our employees and stake-holders that what we do is about us-- about what’s in our self-interest-- the weaker the trust. Lest we feel paralyzed, what do we recommend business owners do to build trust and yet be true to themselves? Define the issue and communicate both the pros and cons of any issue. Provide as many instances as possible of different ways to understand the issue. When we as leaders become bored is when we need to step up the number of times we need to communicate our message! Listen to whatever the person’s perspective is. You will have employees who support or oppose an issue because of personal experience or self-benefit or empathy and compassion for those who need their vote/support. Acknowledge that all of us have “self-interest.” Rather than pretend we are neutral, it is better to say that we do have a perspective and courageously defend it. Politely, civilly present your position. Call to action: encourage your people to take action and vote their convictions. Let’s use the example of a Colorado ballot issue—Amendment 69-- to illustrate how to tell your employees how to vote. 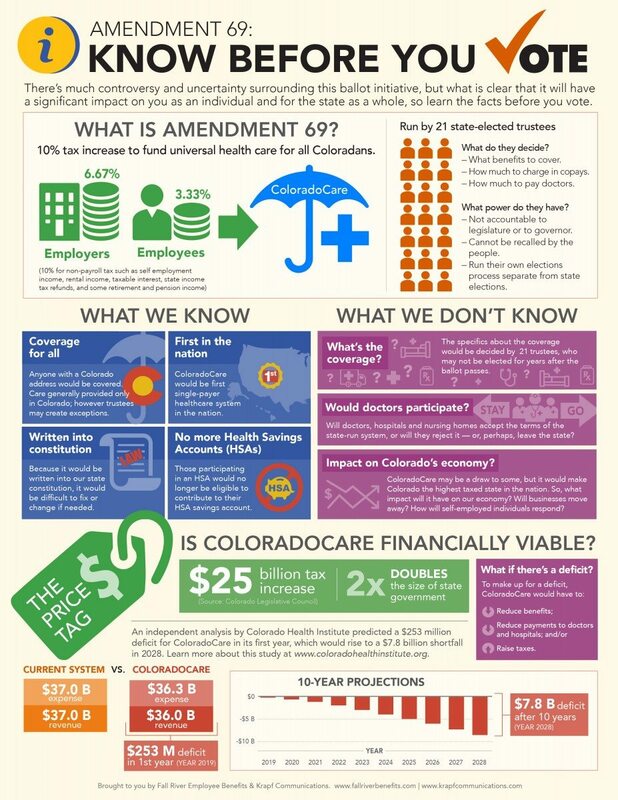 Amendment 69 is a proposed change to the Colorado state constitution that provides a single-payer healthcare payment system, ColoradoCares, through an additional 10% payroll tax –paid 2/3 by employers, 1/3 by employees. This tax would provide approximately $25 billion per year. 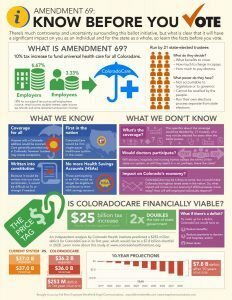 This system would be an independent state agency that doubles the size of the state budget and provide access to healthcare for all who have resided in Colorado at least one year. While I realize that there’s a lot of uncertainty regarding healthcare coverage by many Coloradans, this is absolutely not the answer. ... This will result in $25 billion in unfunded liabilities in Colorado, and the people who will bear the brunt of this cost will be our employers, especially our sole proprietors, small-business owners and the generators of our economic growth. Let us know what your experiences are in communicating on ballot issues with your employees. And urge them to vote! One of the joys of presenting during Money Smart Week is learning about concerns from participants. The best questions—and answers—often come from either new business owners or the most veteran. Q: What are my options for funding a new business? A: You have several choices—each with corresponding advantages and disadvantages. At a recent Colorado Financial Planners Association (COFPA) meeting, Sameer Somal, Blue Ocean founder, gave a sobering snapshot of things every financial advisor needs to consider: what’s next for your practice. When an industry like financial planning is undergoing rapid tectonic plate shifts, the impact of those shifts create a tsunami of change to every participant in the industry—not only advisors--especially their clients. More than 40% of approximately 315,000 advisors will transition their practices over the next 15 years. Have you ever been distracted by the plank in your eye? What about the fly stuck your ointment? I have. And so has every business owner I know! We all need tools that both highlight our blind spots and assist us work around them. To take action, we all benefit from the catalyzing effects of clarity and simplicity. I had a BFO last Wednesday. Facilitating the TiE Rockies Entrepreneurial Roundtable (click for upcoming offerings), I discovered firsthand why a Crankset Group tool--the Bottleneck Exercise--works so effectively to highlight a business owner’s blind spot and allow us to truly take the next step. Why You also Need a Client Happiness Specialist! NOTE: We’ll continue the series on “acedia” next week. I recently hired a Client Happiness Specialist. Don’t have one? You need one too! Why? I believe you want to live a life of no regrets. I believe you want to let yourself be happy, too. via Blogger Why You also Need a Client Happiness Specialist! As indicated previously, in Romans 7:17&20, sin is a noun, something that is living in us. Is Paul trying to avoid responsibility? No, put in context, he is using his own experience to define reality for us and help each person understand that through accepting Christ’s death at the Cross as payment for his/her sins (see definition above) and through daily faith in Jesus Christ, sin (the “thing” living in us) is rendered powerless. “Who will rescue me from this body of death? Thanks be to God – through Jesus Christ our Lord!” The “sin living in” you is what the Bible calls a “sinful nature” and is why it says that “all have sinned.” With sin living in you, it is impossible for you not to sin (the verb). However, God is a god of justice, mercy, and grace; He had and has a plan in place for humans to be set free from their sinful nature. God gave his own Son Jesus Christ, King of His Kingdom, to come to earth and to die in your place to pay the penalty of death for your sins and to provide a solution for rendering your “sinful nature” powerless through daily faith in Christ. You may be thinking “this all sounds very strange” and wonder, as many have over the centuries, why did Christ have to come to earth and die? As our creator, couldn’t God “just fix it?” Or why couldn’t Jesus just come to earth and “Wow” us into believing in Him? I will explain why God’s solution had to be done this way in the next issue of The Spirit Led Business™, Christ’s Finished Work of Grace at the Cross – What Did it Do For You? But for now, let’s look at what the Bible says about God’s solution. “Therefore, there is now no condemnation for those who are in Christ Jesus, because through Christ Jesus the law of the Spirit of life set me free from the law of sin and death. For what the law (The Ten Commandments) was powerless to do in that it was weakened by the sinful nature, God did by sending his own Son in the likeness of sinful man to be a sin offering. And so he condemned sin in sinful man, in order that the righteous requirements of the law might be fully met in us, who do not live according to the sinful nature but according to the Spirit” (Romans 8:1-4). “I have been crucified with Christ (when he died for my sins at the cross) and I no longer live, but Christ lives in me. The life I live in the body (my physical body with a sinful nature), I live by faith in the Son of God, who loved me and gave himself for me. I do not set aside the grace of God, for if righteousness could be gained through the law, Christ died for nothing!" (Galatians 2:20-21). Of the world’s adult population, 33% list Christianity as their religion and 76% of the adults in the U.S. list Christianity as their religious affiliation. Why? Because Christianity is the only religion that promises to set you free from the sinful nature and give you eternal life in heaven through an act of God’s grace by believing in his Son Jesus Christ, King of God’s Kingdom. In all other religions YOU must control your behavior and work your way to heaven, a mission impossible! Many of those listing Christianity as their religion believe that they are a “Christian” because they were raised in a Christian home or attend a Christian church. Those are good things, but they do not make you a Christian. So let’s look together at what the Bible, God’s operating manual for humans, says about becoming a Christian. Going to church without God living in you is just being religious. You become a child of God and He becomes real and personal (relational) in your life when you invite Him into your life by believing in his Son, Jesus Christ. Before counting on God’s help in this life, it would be wise to check and make sure you are a child of God, a “born again” Christian. Real Christianity as explained in the Bible is not a religion; it is a personal relationship with God. God is a personal being and wants to be personally involved in your life. “Jesus replied ‘If anyone loves me, he will obey my teaching. My Father will love him, and we will come to him and make our home with him’” (John 14:23). Christ taught us in John, chapter 3, how to start this relationship. “In reply Jesus declared, ‘I tell you the truth, no one can see the kingdom of God unless he is born again.’” That is “born of…the Spirit (of God). Flesh gives birth to flesh, but the Spirit gives birth to spirit (in humans). For God so loved the world that he gave his only begotten Son, that whoever believes in him shall not perish but have eternal life” (John 3:16). The Bible has much to say about how to establish and maintain such a relationship with God, including the benefits of the relationship. When a person puts their belief in Jesus Christ that person is “born” into God’s family and at that time their personal relationship with God begins: “Yet to all who received him (Christ), to those who believe in his name, he gave the right to become children of God - children born not of natural descent, nor of human decision or a husband’s will, but born of God” (John 1:12). That is, your spirit is given life as was intended from the beginning of creation and God lives in you (your spirit) for eternity (forever, regardless of what kind of physical body your spirit lives in)! “Jesus answered, ‘I am telling you the truth: no one can see the Kingdom of God without being born again.’ ‘How can a grown man be born again?’ Nicodemus asked. ‘He certainly cannot enter his mother's womb and be born a second time!’ ‘I am telling you the truth,’ replied Jesus, ‘that no one can enter the Kingdom of God without being born of water and the Spirit. A person is born physically of human parents, but is born spiritually of the Spirit. Do not be surprised because I tell you that you must all be born again. The wind blows wherever it wishes; you hear the sound it makes, but you do not know where it comes from or where it is going. It is like that with everyone who is born of the Spirit’” (John 3:3-8 GNT). “For God so loved the world that he gave his one and only Son, that whoever believes in him shall not perish but have eternal life. For God did not send his Son into the world to condemn the world, but to save the world through him. Whoever believes in him is not condemned, but whoever does not believe stands condemned already because he has not believed in the name of God's one and only Son. This is the verdict: Light has come into the world, but men loved darkness instead of light because their deeds were evil. Everyone who does evil hates the light, and will not come into the light for fear that his deeds will be exposed. But whoever lives by the truth comes into the light, so that it may be seen plainly that what he has done has been done through God" (John 3:16-21). What the Son of God is saying here is that the only way to Heaven is to be born again and once a person is born into God’s family then, and only then, can a person see that he/she receives eternal life in heaven only through a work of God’s grace through belief in Jesus Christ. The way to receive this gift is by believing in Jesus Christ! He is also saying that rejection of God’s gift is a sin resulting in a condemnation of death (separation from God in Heaven and His life giving power for eternity). In other words, until you accept it by faith, you will not understand it! In Part III we will examine the Enormous Benefits of Real Christianity. Managing our companies provides the most strenuous leadership challenge: though owners must lead by example, they in fact cannot lead others where they themselves have not gone! Last week, I talked about how a couple of merchants in a little medieval town created an unanticipated social capital footprint. Their decisions to uphold and propagate standards of honest weights, excellent service, and integrity had far-reaching consequences for themselves and their community and the world. It is little surprise, then, that out of that unintended stock of positive social capital grew a flourishing trade that yielded the fruit of leaders who made London into the center of banking and commerce for a growing empire. Conversely, what does a shrinking social capital base look like? 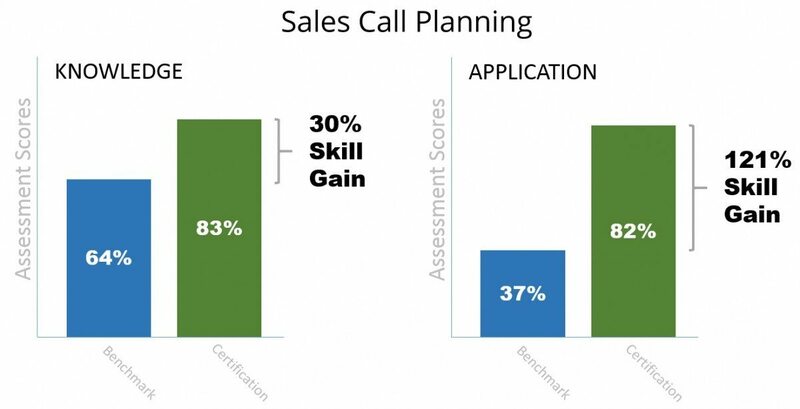 via Blogger Can Your Sales Team Make You into a Top Quartile/25% Company?